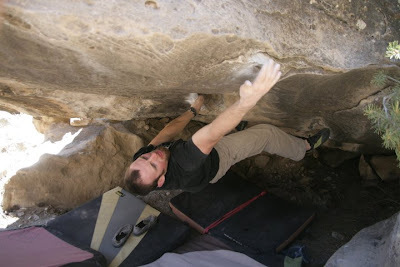 The winter in Flagstaff has been optimal for rock climbing compared to last winter. There has not been much snow, and when it has snowed it melted quick. I've been climbing at Priest Draw, Buffalo Park, and Grasshopper Point. I have repeated a few new link-ups at the draw on the Puzzle Box roof including Rise of the Phoenix, Huffalufafish, Cosmic Phoenix, and Sufferfish. I also did the new low left version to Floor Pie which is an outstanding line that is better than the original with compression style climbing out the roof. A few days ago I did The Beast From The East at Grasshopper Point which has unique moves on sandstone. Here is a video of Noah Rayburn crushing the line: beast from the east. from Noah Rayburn on Vimeo. I got to spend a fair amount of time in Hueco this season even with nursing school. I guided for Wagon Wheel Co-opt this year and stayed at the Strong's land. Wagon Wheel Co-opt is different than the Hueco Rock Ranch. The concession is low key, doesn't advertise, and is focused on rock climbing and fun. I worked on Full Service, which is my longest standing project to date. I've been trying the climb since I was in high school. I realized that while I may not be the strongest climber, I get projects done over time through persistence, hard work, epicing, and effort. 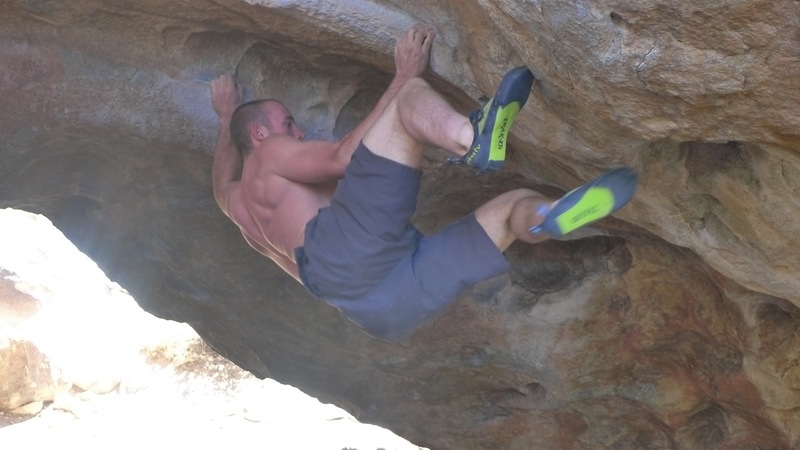 I made another trip down to Hueco near the end of February with a crew from Flagtown. I flailed on my project as usual, but this season's failure has increased my motivation to get stronger for next year. This season was a reminder that climbing should not be taken too seriously, after all I don't get paid to climb. Rock climbing is all about the fun. It was good to see many of my friends who stay the winter there or were passing through. I started working a new project the last day of my trip called Eckagrata, also known as the Wellsite Dyno. Eckagrata starts on two small pockets, then moves up to a good right hand pocket and a poor left hand pocket to a massive crux lunge. Aubrey flashing the Dark Heart Crack. Flailure on Full Service in 80 degree weather. 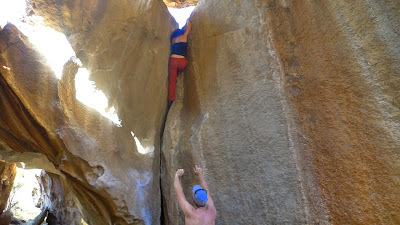 Last week I made a trip to Joe's Valley for some classy sandstone bouldering. I spent my short trip climbing on a few projects in the Left Fork. I worked out the beta to the crux of Strongbad, but did not have enough time to send. I also made it across the river and slogged uphill across an epic muddy and snowy slope to try the Masterpiece. The Masterpiece is an amazing roof climb that follows a seam after a crimpy crux with a strange toe hook to a tall prow finish. Props to James for having the vision to make this line a reality. This climb is big, badass, and proud. I would say that if the BLIMP roof is a 5 on the proud scale, then this climb is a 4, but the difficulty of the two problems is similar. My trip to Joe's caused me to realize two of my main weaknesses: crimping and big dynamic moves. The style of climbing here does not suit me well, but I am glad that I have come to the realization of my weaknesses which will allow me to improve as a climber. Killed By Numbers, Left Fork.